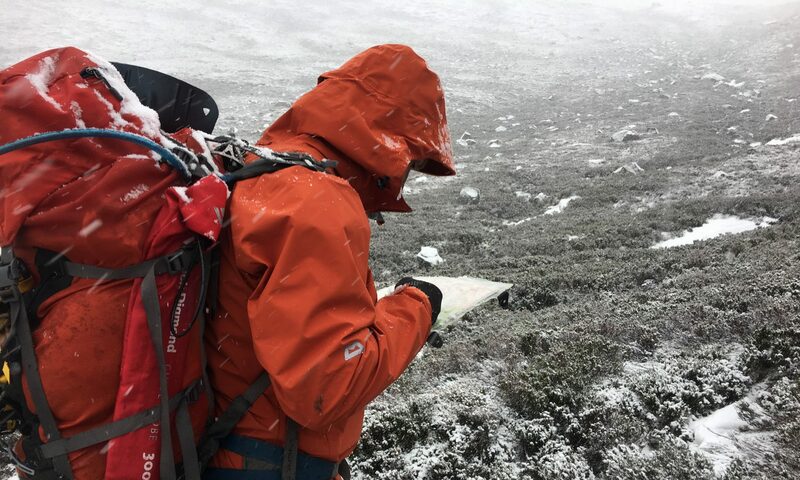 After a day wading through deep soft powder snow in the Lairig Ghru and feeling like swimming was the only option to make any progress, I was incredibly excited to be offered a pair of snowshoes to borrow for the day. 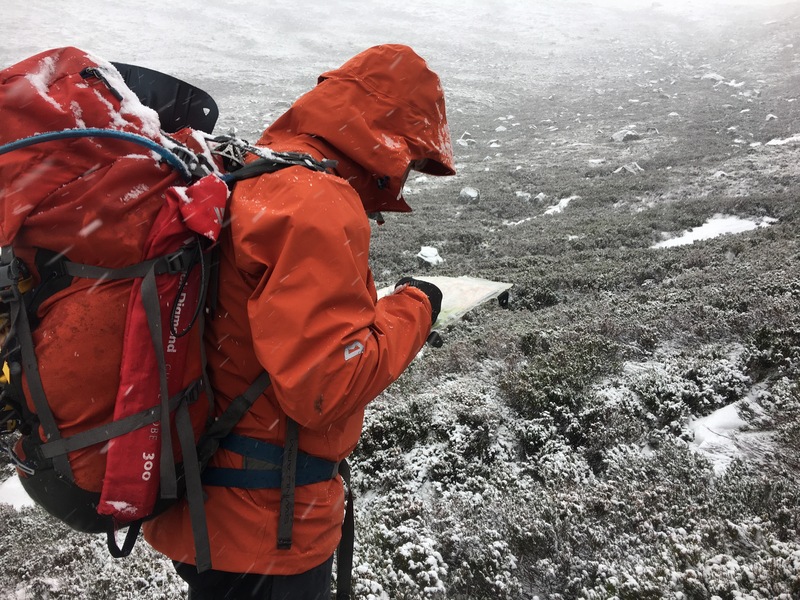 I’d never snowshoed before, so the chance to have a go was very appealing, particularly if it meant that I could still get some winter mountain days completed without over exerting wading through snow on my own. If you’ve never snowshoed I’d definitely recommend it. You step into snowshoes in much the same way you do a pair of crampons, so you do need your boots to be B2 or B3 for them to have the rear gap for the clips. Beyond that they need no real experience to walk in them, just a gait like John Wayne. You do need to have a pair of walking poles to provide the momentum to move though! Having snowshoes on as I left the car park at Glen Feshie meant that I made really quick progress up the forest track and out on the mountain. Not quite as quick as the smug cross-country skiers but much quicker than the wading i had done the day before. I could have been in the Alps or Scandinavia the weather was fantastic, not at all like Scottish winter! As I ascended Sron Na Gioath the benefits of the snowshoes became very clear. I was following the line of the skiers who had left the car park ahead of me, and while I was sinking slightly more into the snow that they were, I was not sinking anywhere near as much as the walkers footprints indicated the couple of walkers ahead of me were. In fact I had a cheery smugness as I passed them near the top of the mountain, I wasn’t exactly bright and breezy but I was not as sweaty and wrecked like they were. This also gave me a massive confidence boost. 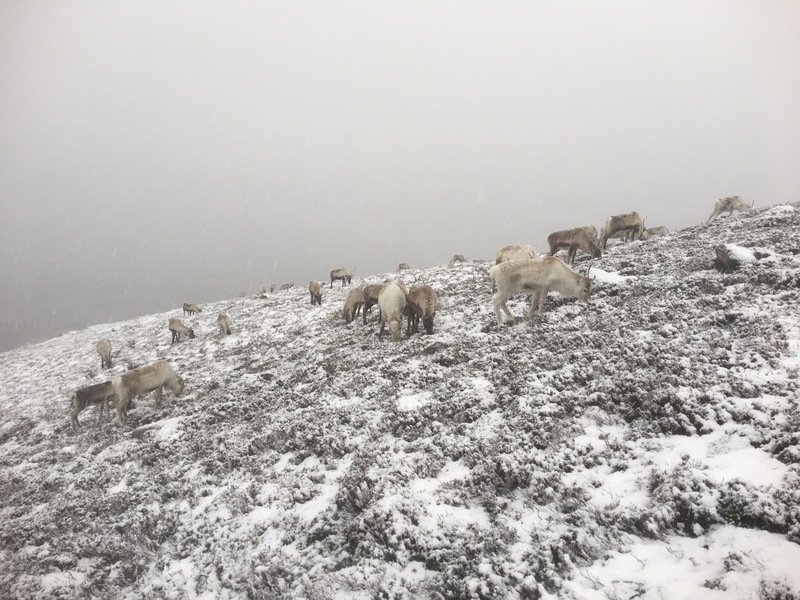 Having been up a few munros this winter with considerably fitter people than myself I had started to feel like winter mountaineering was out of my league, when actually I’ve just spent most of the winter so far wading in the snow. 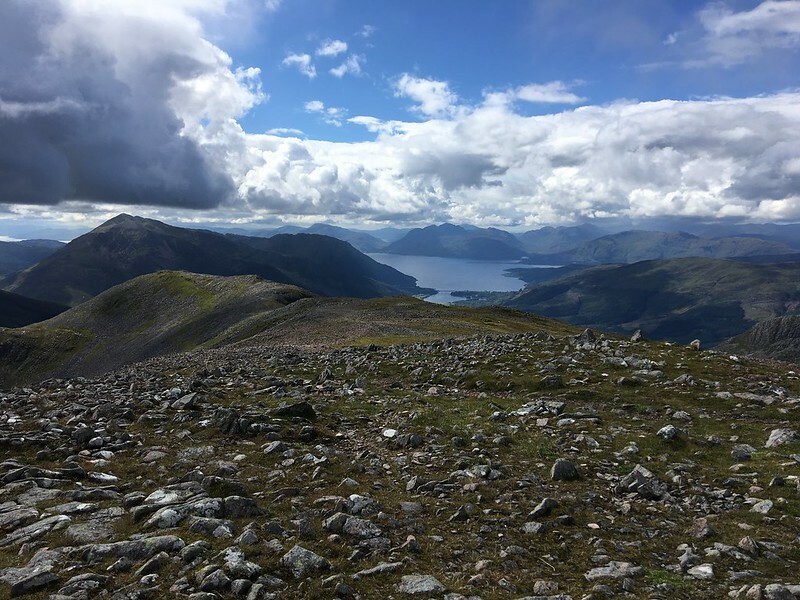 From the summit ridge I headed to the munro top in the mist and continued across to follow the mountain tops back round to the woodland. 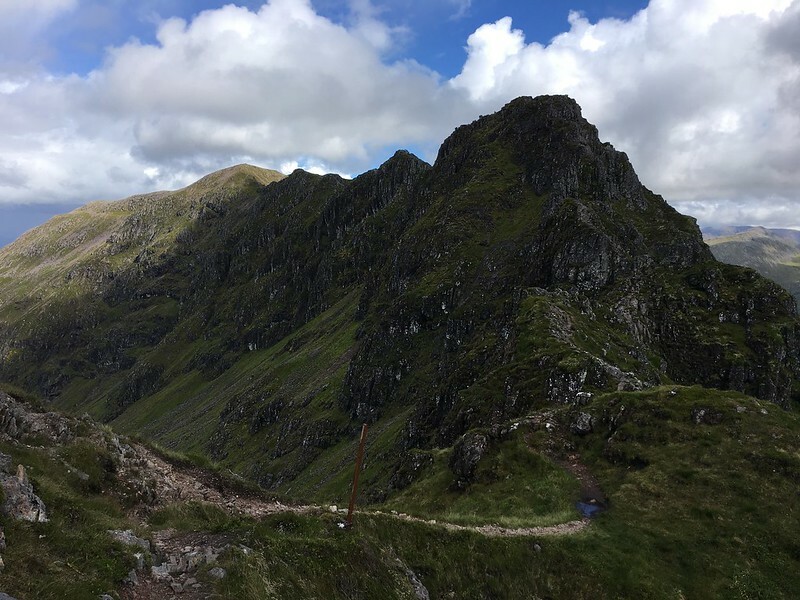 I’ve driven down the Glencoe valley numerous times and looked up at the jagged line of the Aonach Eagach ridge, impressed with the shape and both desperate and terrified at the prospect of scrambling the ridge. 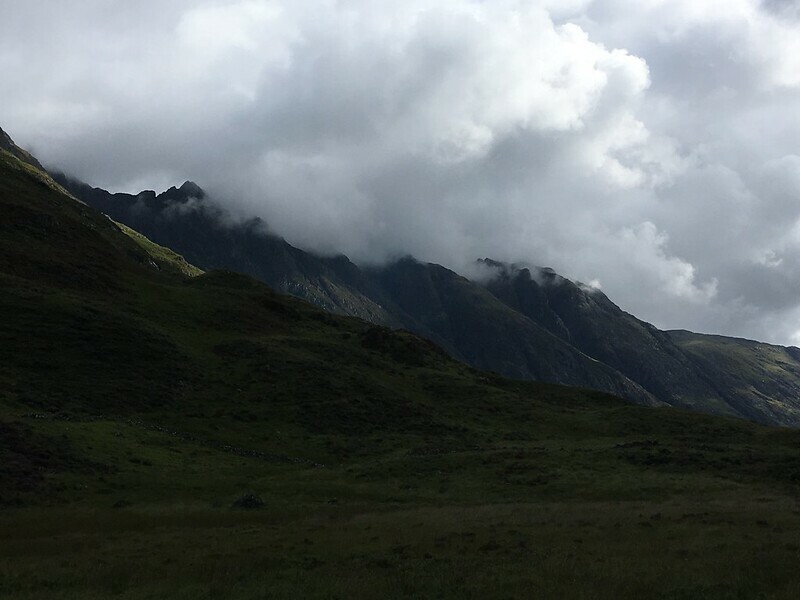 I’ve wanted to tackle the ridge since I first visited North West Scotland aged 18, so when I was recently rained off a trip to scramble the Cullins I decided this was a perfect substitute. 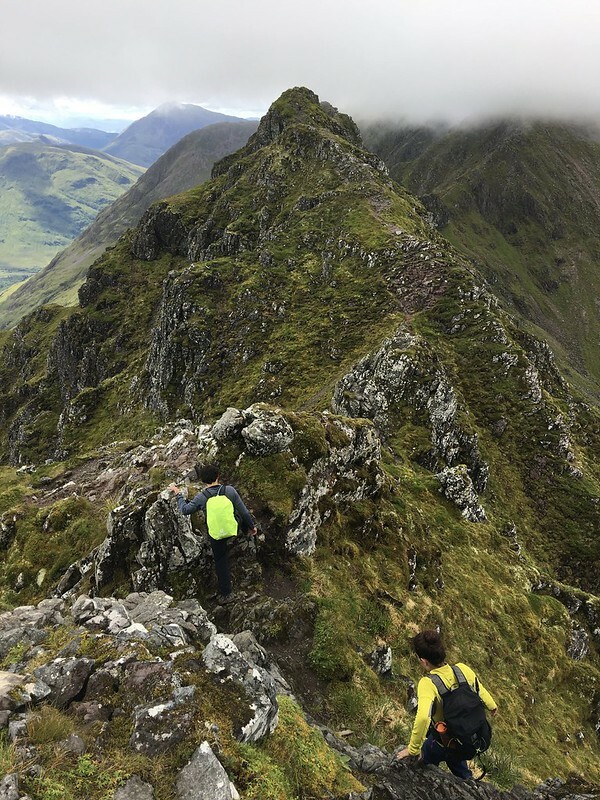 I should caveat that as entertaining as the Aonach Eagach ridge is, if you’ve not yet completed routes such as Sharp Edge or Crib Goch then consider getting some serious grade 1 scrambles under your belt before you have a go at this. 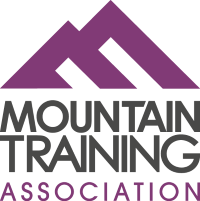 Its a serious undertaking, as nowhere along the route can you escape and some of the sections of scrambling are exposed and committing. The first thing to note doing this ridge is that is essential to have a plan for transport between the start and finish as the last thing you want to do is end up walking back up the busy road for your car at the end of the day. We had planned on hitchhiking – but a summer weekend is the moment to try this with traffic being too busy to stop. 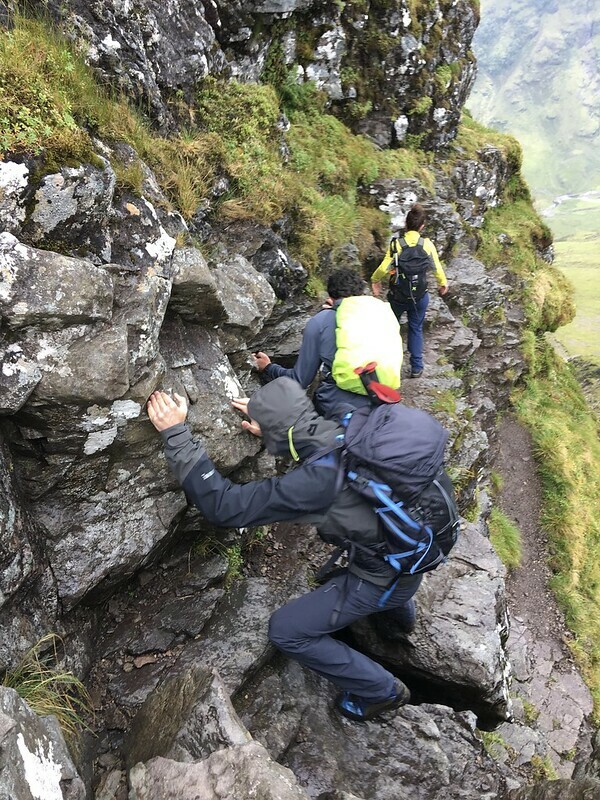 After 15 minutes of trying we were not getting anywhere; then two other hikers arrived with the same idea – 4 of us had no chance of getting a lift. Thankfully they were off to do the ridge too so we decided to car share. The car park at the start of the route is tiny and usually filled with tourists wanting to quickly photograph the mountains as they drive through the valley so I was lucky to squeeze my car into a spot. 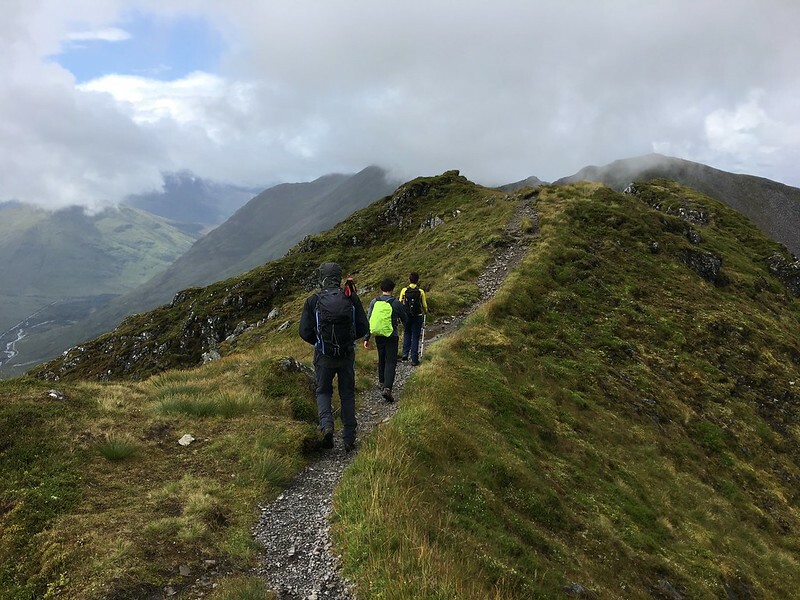 We set off from the car park at a slow pace; the path up to Am Bodach might be easy to follow but it’s quite steep. Initially the path is across a broad ridge and is easy to follow, but its not long before the scrambling starts and route finding is required. 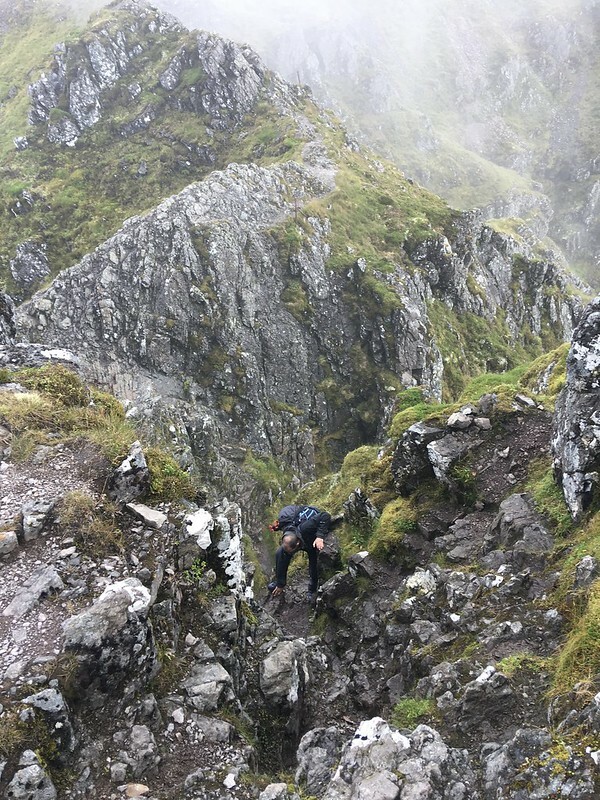 Scrambling on the Aonach Eagach ridge is really downclimbing, which requires good foot placements and a slow pace. The first of these sections comes after just leaving Am Bodach summit. I was surprised to find the scrambling isn’t relentless, there are sections of the route where you resume walking. 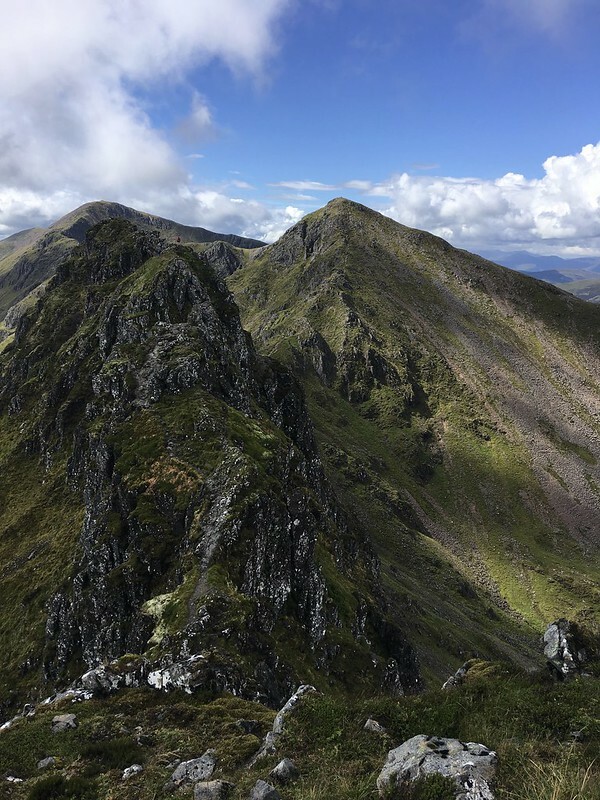 It is apparent from the views though that you really can’t escape the ridge once on it and the scrambling varies from terraced ridges, knife edge aretes, greasy gullys and towering chimneys. Towards the end of the ridge are the Crazy Pinnacles, which we took by heading right and down climbing a fairly greasy gully. This is definitely not a route to do in the rain! 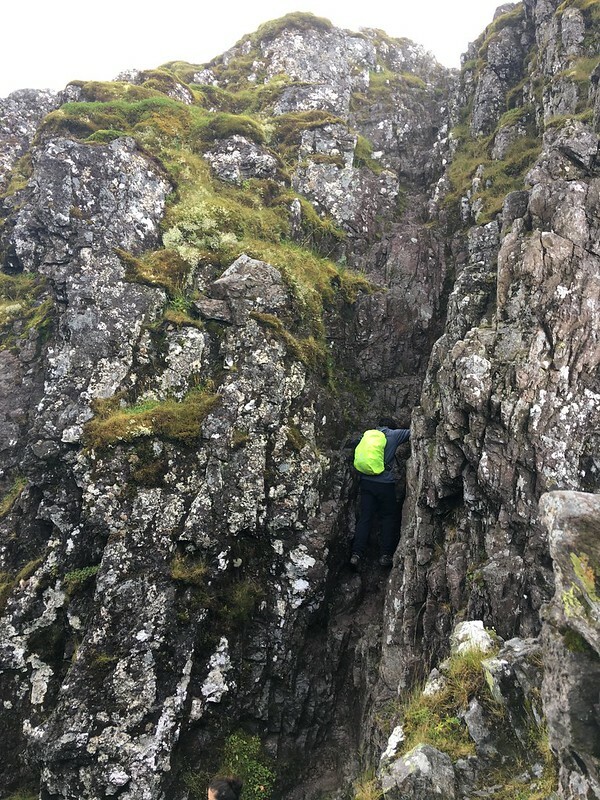 Once off the Crazy Pinnacles and over Stob Coire Leith the serious scrambling ends. From here make sure you continue on to the large shelter and trig point at Sgorr nam Fiannaidh. 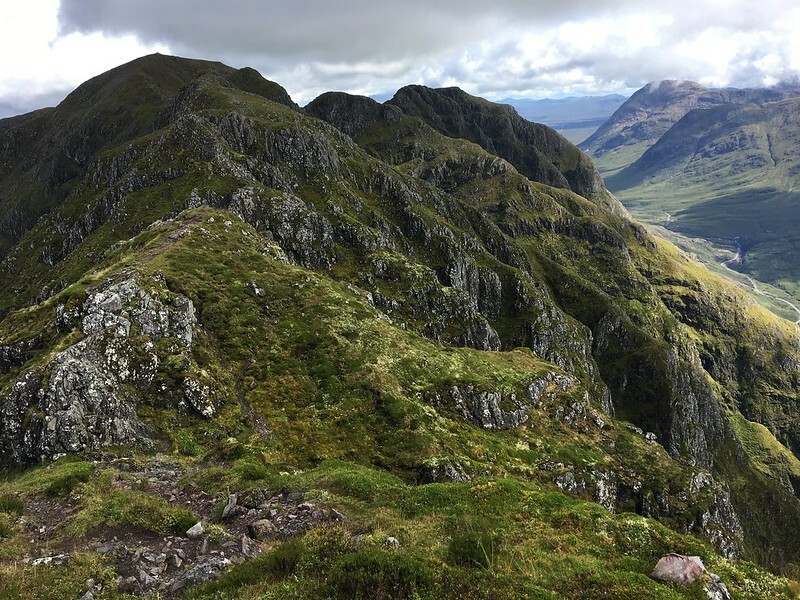 From here in good visibility its possible to see the path heading south west down to the Claichaig gully – do not take this as it is widely considered a dangerous descent route. Instead continue across heading north west towards the Pap of Glencoe. 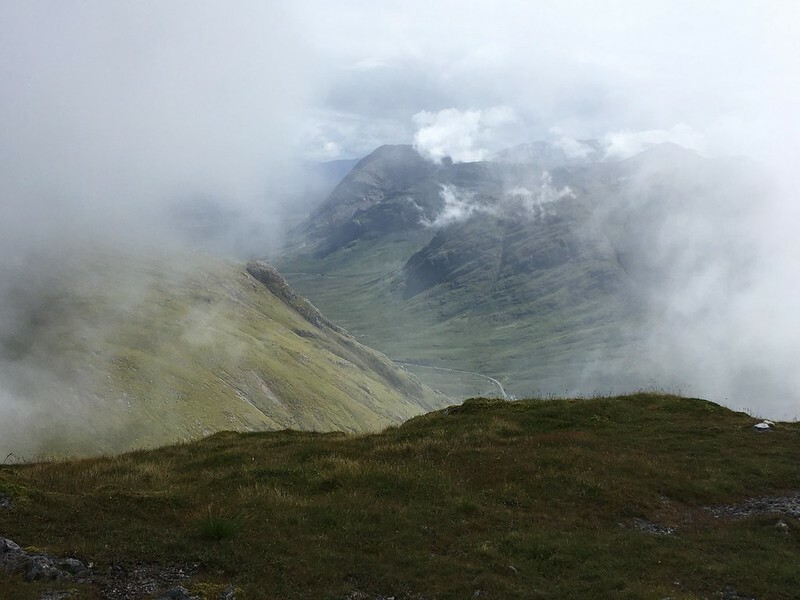 As you cross the broader peaty plateau you will pick up the descent path to take down to Glencoe and the valley. We met a group of older men half way along the ridge who were definitely having trouble with the scrambling and taken 5 hours to get to the Pinnacles. 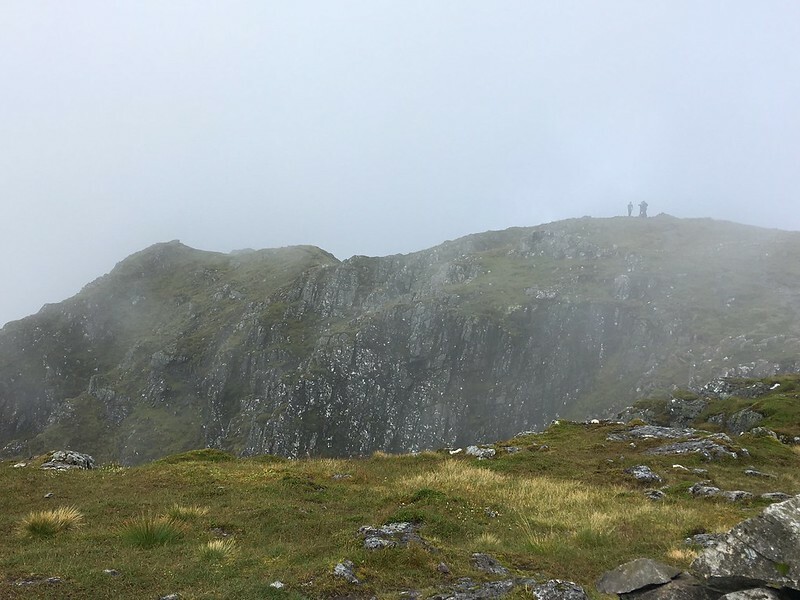 Later when we were in the pub with a whiskey they were only just off the hill (12 hours after starting) – a reminder not to under-estimate the ridge.